My day job seems to absorb more and more of my time, leaving me with little space for side projects like this blog, but I have tried to keep in touch with the fall ready-to-wear collections, at least from the narrow focus of what use designers are making of boots this year. And there were plenty of them, from ankle to thigh-high, and from Alberto Ferritti to Zuhair Murad. 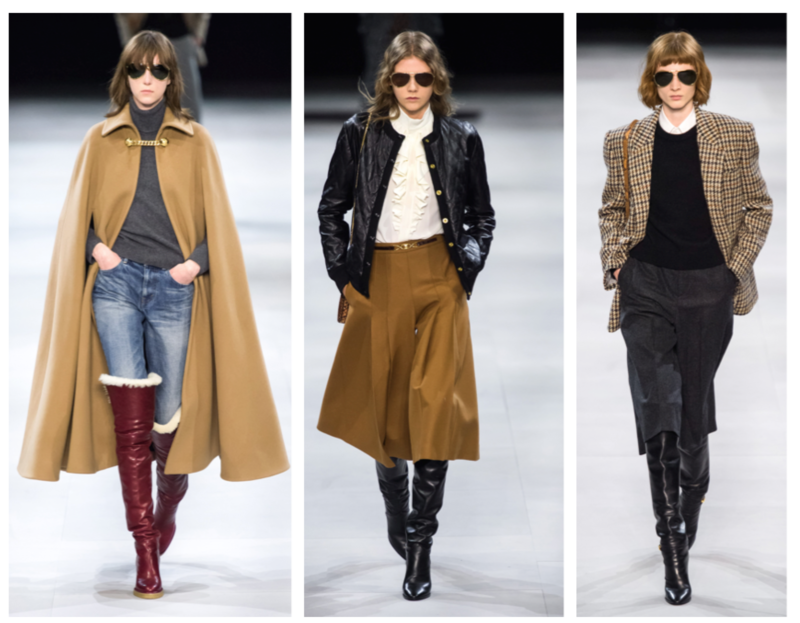 There were towering mock-croc thighboots at Max Mara and seventies-style platforms at Longchamp. But the one that garnered all the attention, and not just from me, was Hedi Slimane’s collection for Celine, a time machine taking us straight back to 1977/78, with pleated, knee-length skirts, horse-bit belts, white silk blouses, blazers, capes, and culottes. 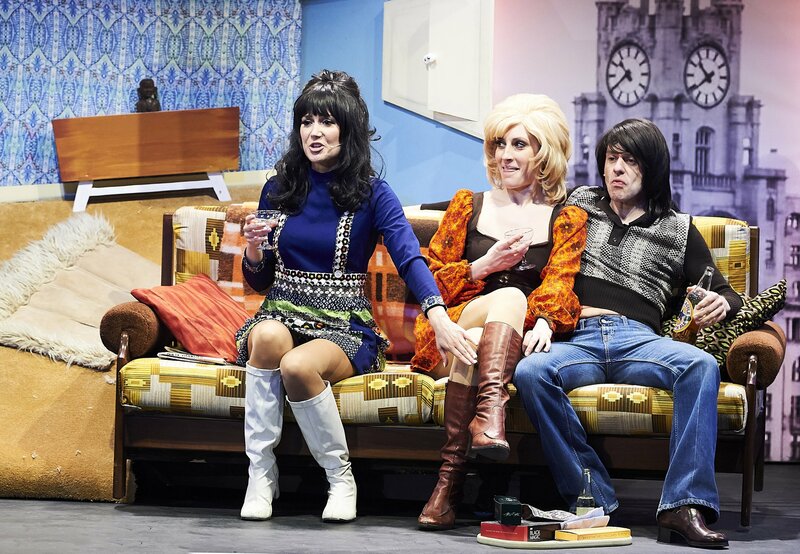 There were also glossy knee-length high-heeled boots, thigh-high boots over skinny jeans, and even sheepskin lined thighboots of the sort once sported by Kate Bush. 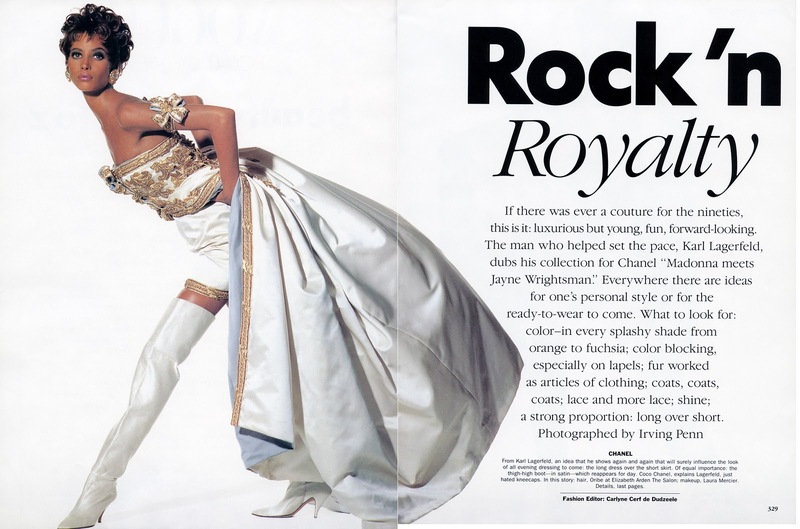 Writing for Vogue, Sarah Mower described it as typical of the bourgeois French girl’s wardrobe throughout the ’70s and ’80s, but it could equally have been seen in Britain or America at the same time. It’s exactly the relaxed, countrified look typical of the second half of the nineteen seventies, which I discussed in an earlier post, “baggy boots” and all. In the Daily Telegraph, Hannah Rochell pointed out that this “long skirt, tall boots” look has actually been around on the posts of various social media influencers since the fall of last year, suggesting that Slimane’s work was perhaps not as newsworthy as the mainstream fashion press was suggesting, although no less desirable for that. Meanwhile, I found myself wondering when was the last time that culottes teamed with knee-length boots were popular. My guess is that it’s been a good 40 years. Karl Lagerfeld, Designer Who Defined Luxury Fashion, Is Dead. New York Times, Feb 19, 2019. Morris, Bernadine. At Lagerfeld’s Paris show, the 18th Century goes modern. New York Times, Mar 29, 1977: pg.41. Morris, Bernadine. St Laurent: No Fuss, Just Style. New York Times, April 1, 1982: pg. C8. The Holiday season is almost past, but I wanted to push out at least one short, but seasonally appropriate post to make up for the long hiatus on this blog. As you’ll have gathered by now, I’m happy to scavenge any potential source of information to unwrap the history of the fashion boot and in the run-up to Christmas I stumbled on a new one. American readers will almost certainly be familiar with the Radio City Rockettes, a precision dance company that has been performing at the Radio City Music Hall in New York since 1932. The Radio City Christmas Spectacular is as much a part of the Holidays as Santa Claus and the Macy’s Thanksgiving Parade. 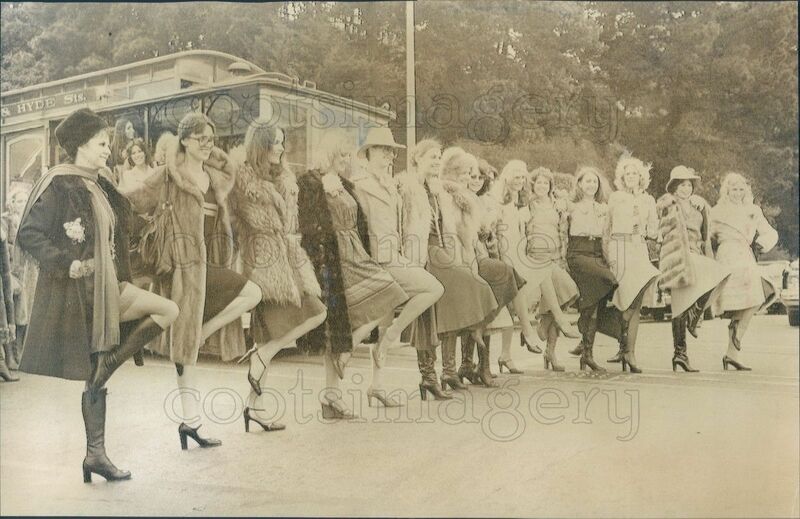 As it happens, the Rockettes had a long tradition of celebrating the recruitment of dancers for the Christmas Show by getting them to do a kick line for the press cameras. 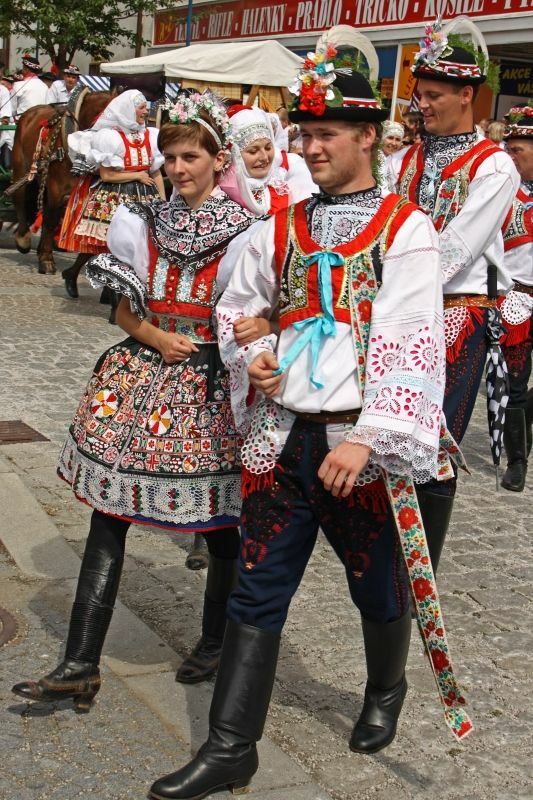 In the past, they often did this in their street clothes, which, given the time of year, often included boots. And if you dig around on the web for a while, you can find these. Included here are four photos from 1970, 1976, 1977, and 1978. 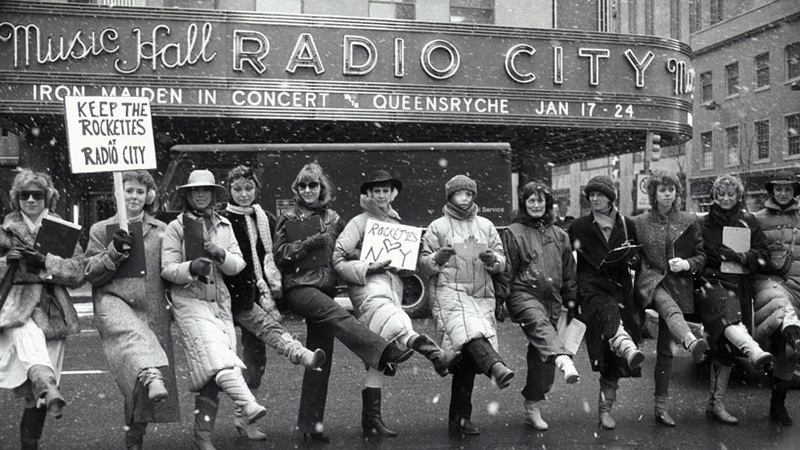 It’s a bit of a cheat, because they’re not all from the same type of event; the ’76 picture is a press image from a tour to San Francisco, while the ’78 one is a picket line when the Rockettes were protesting the threatened closure of Radio City. But let’s ignore those inconvenient details and focus on what the photos actually show. 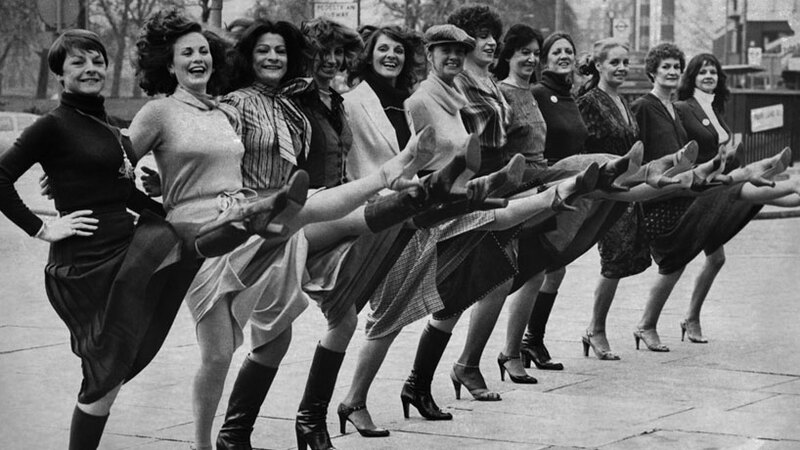 If you look along the kickline for 1970 it’s pretty much as you’d expect (assuming you’ve been following this blog and/or reading the book); close-fitting boots, low-heeled, some rising above the knee. The line is very long and the resolution is none too great, but I’d take a guess that about 1 in 3 of the dancers is in boots. By 1976, that number is just shy of 50%; the heels are of the higher, stacked variety and there’s now a mix of the straight-legged, “baggy” boots with the calf-hugging ones. Jump forward a year and we still have an almost 50:50 split of shoes and boots. The boots are now almost all straight legged and the heels, while still high, are beginning to acquire a taper. But the most interesting picture is from 1978, where we have a pretty much 100% showing for boots. This is understandable, given that the photo was obviously taken during a snowstorm, but the mix of styles very definitely reflects some trends that would become important moving on into the the nineteen eighties – more calf- and ankle-length boots; a greater emphasis on loose-fitting, casual styles; and boots worn under pants. Some of this is undoubtably the fault of the weather (check out the long, down coats, for example), but as we’ve seen in earlier posts, the late seventies saw both diversification of styles and a shift towards lower heels and shorter leg lengths. By the mid 1980s, these would completely replace the higher legged, high heeled boots of the seventies and those styles would not return to popularity for another decade. But not the end of the road, I hope. I haven’t managed a post for six months, largely because of having to manage a major project in my ‘day job’ as a museum curator. That will be an ongoing situation for the next few years, and makes blogging a bit of a challenge. 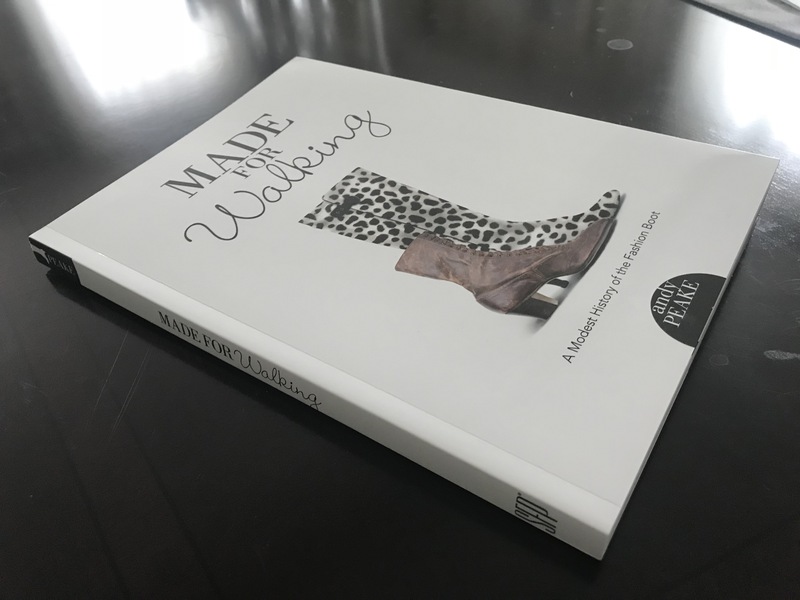 I had almost decided to call it a day on the “Made for Walking” blog – the book is published now; it’s selling, but I did wonder – as all authors do from time to time – whether anyone really cared. And maybe it was time to cast about for a new project. Then, a few weeks ago, I ‘outed’ myself to a couple of friends who knew nothing about this project, giving them copies of the book to read. I’d expected polite enthusiasm, but it turned out they really liked it. They had a ton of questions, all of which were excellent, and provided me with a woman’s perspectives on the topic that (with the exception of my wife) I’d been lacking. They wanted more. They were kind about my insights, but felt I should have talked to more women. One of them was so enthusiastic that she went straight home and texted me photos of all the boots in her closet. It was a fascinating conversation, and I came away stoked and energized to write more. So thank you, Mary and Shana – I am going to blog some more, albeit sporadically. And you can expect the first of these in 2019. Happy New Year! The attention was not surprising, because the sight of a woman in the heart of the city wearing skirts or dresses with knee-length boots was an unusual one for the late nineteen fifties. But Levine didn’t mind. She saw it as a tribute to the boots she loved to design and wear. She was no stranger to skepticism, amusement, or in some cases outright ridicule. Levine had spent the last five years on a quest to redefine the utilitarian boot as a fashionable shoe. It was proving to be an uphill struggle. The years since the disappearance of the Russian boot in the early thirties had not been kind to the idea of a fashionable boot for women. After a brief flirtation with stylish designs, the shoe industry had concluded that the role of the boot was overwhelmingly one of protection. This was something that the rubber rain boot did much better than the leather Russian boot. There were some short-lived attempts to revive the idea of a fashion boot. 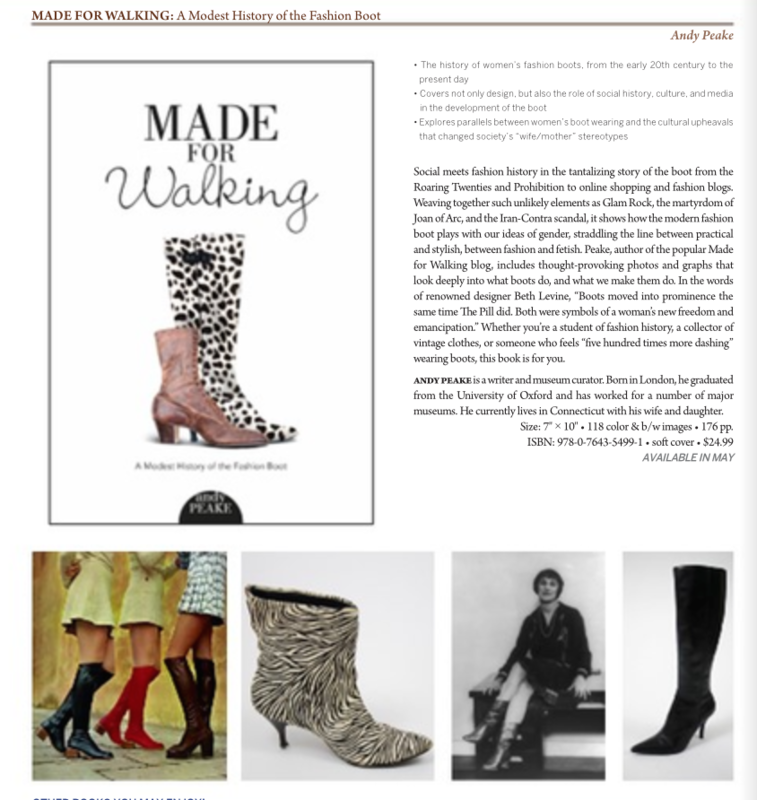 At the end of the 1930s, there was a brief revival of interest in fashionable ankle boots for women, associated with clothing that paid homage to the so-called Romantic era. They were not worn very widely, but a number of designers included them in their collections. 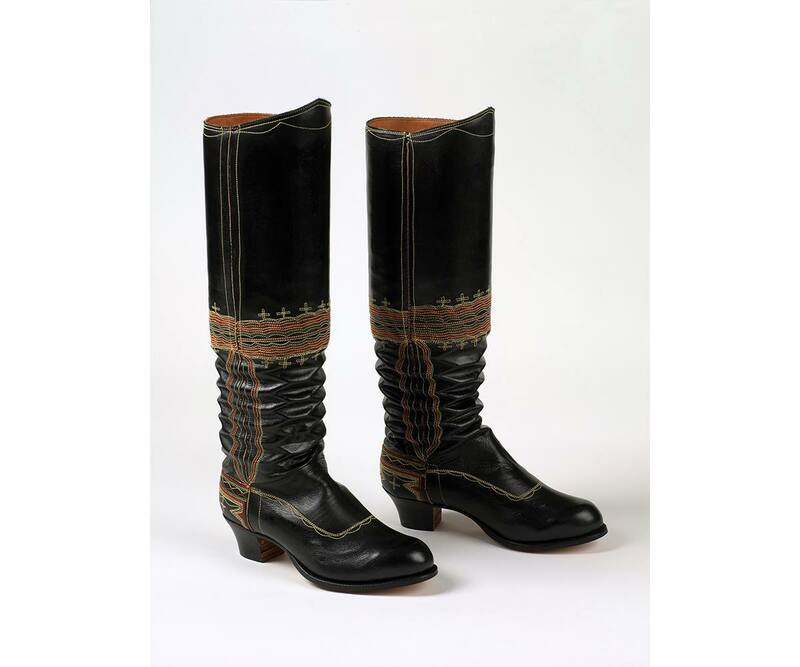 One of the most notable examples was André Perugia, who came up with leather button boots in black or cream that are now in the collection of the Metropolitan Museum of Art, New York. But these were a rarity. For the most part, the women’s boot styles of the forties and fifties tended to be trim, ankle-length rain boots. That had not always been the case. If you want to get a sense of what the earlier generation of rain boots for women looked like, mail order catalogs provide a useful window. The autumn/winter Kays Catalogue of 1928 shows a couple of styles of Russian boot. But by 1933, the Russian boots were gone. Instead we have two pages of rain boots. Some of these are typical Wellington boots. But the catalogue also featured “stylish” models “for city wear… extra-high shaped leg, close fitting, 1 1/2″ Cuban heels.” The leg height is 16 1/2 inches, which takes them right to the knee. And they are specifically described as “practical high-leg fashion boots“ (my emphasis); a similar pair came in two-tone rubber. To a large extent, this view was shared by the people that made them. Shoe manufacturers and retailers saw boots as a separate category of footwear from shoes, to be worn for protection from bad weather or for work. Unlike shoes, boots did not have to be fashionable, only practical. This was the world that Beth Levine set out to change. “Hey, Where’s Your Horse?” Hartford Courant, Jun 16, 1963: Pg.7E. Bergstein, Rachelle. 2012. Women from the Ankle Down. New York, Harper Perennial. Author’s advance copy. Suddenly this whole book thing has become real. It should be in the stores in 6-8 weeks’ time. Order your copy from Amazon. And huge thanks to my awesome publishers, Schiffer Publishing.